“I wanted to create this story of one seemingly impossible dream and make it a reality to inspire people,” Ossevoort said. The 2,500-kilometre, 17-day journey was achieved with the help of a mother and daughter team from Iqaluit, Matty McNair and Sarah McNair-Landry. It’s not the first time a tractor has made the trip. Sir Edmund Hilary led the first mechanized trip to the pole using Ferguson TE20 tractors in 1958. Ossevoort was also travelling with a mechanic, two truck drivers and a creative director. 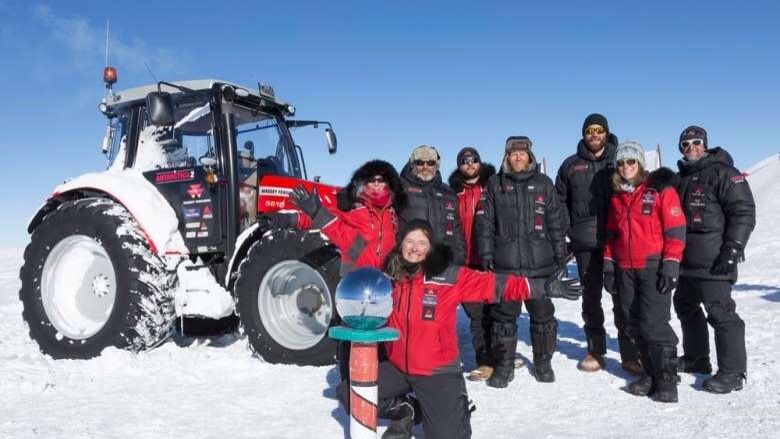 She plans to build a snowman at the pole, before turning around and driving the 2,500 kilometres back to the Antarctic coast. This entry was posted in travel and tagged Antarctic, christopher macgowan, Ossevoort. Bookmark the permalink.